Hello friends . . . .
We have a WINNER of the Rebekah L. Smith book. And many happy stitches to you! I’d like to introduce you to someone and something very special. share her love of the needle, handwork & wool appliqué with you. has recently been released by C & T publishing. 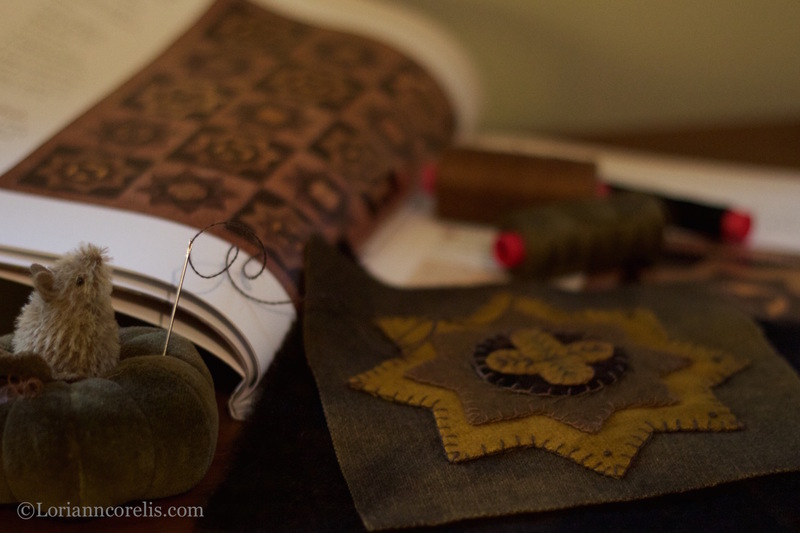 This beautifully written book is the perfect introduction to wool appliqué. step by step instructions and full size pattern templates. 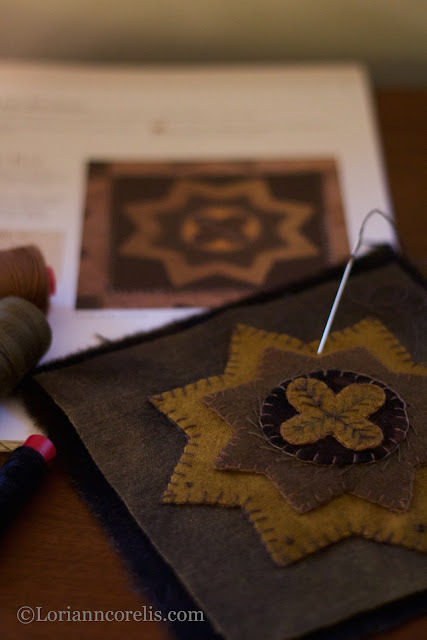 Rebekah’s love of early textiles can be felt in each of her designs. her designs will easily speak to your heart as well! perfect addition to your creative library! *** Just leave a comment on this post with your email or contact info! Looks like a great book and congrats fr being included Lori! Would love to have a copy of this book! Love the color palette!!!! I would love to win and add this to my collection! Always enjoy seeing what you have made and look forward to seeing you at Ghoultide! This book looks wonderful~crossing my fingers that I might win it! Hugs to you! Love the blog tour & love the book. But I already on the book...PREORDERED...because I couldn't wait!!! Book #2 on the drawing board??? Really enjoying this blog tour! Rebekah's book is so beautiful......hoping it is the first of many to come! Lori this book looks so awesome! I am hoping to win a copy but if that doesn't pan out I will surely order one! Love your blog! Are you going to publish your own book some day? Would want one for my library for sure!!! Hoping to win RS new book, crossing my fingers ~ it's scrumptious! Thx for the fun Lori, good luck to all! Wonderful things in this book! I love your pincushions and those tiny mice...so sweet! Thanks again for the giveaway!!! Wow your things are beautiful. I enjoyed my visit. Love your Blog and your applique work is stunning. Rebekah is a wonderful designer and artist. I would love a chance to win a copy of this book. Thank you!! Please enter me to win this amazing book. I just found your blog and so glad I did. I love what you are stitching. The book looks amazing - she is an amazing artist - as are you. i can see why you are kindred spirits. Great blog tour - and wonderful book giveaway! what a beautiful book - I love working with wool in the fall and winter - it's such a relaxing thing to do in the evening. Thank you for the chance to win this book. Would love to win this book. Enjoying the blog tour. Your art is absolutely beautiful, such detail and originality. Thank you for sharing. Also thank you for being a part of the Rebekah Smith giveaway. Would love to win a copy of This amazing book. Lovely book and I'm really enjoying your blog tour!! I spotted this book at our local library, it was donated by the local quilt guild. As I rug hook and also do wool applique, I immediately checked it out. It is wonderful! I took it to our local Fiber Art guild and immediately it was claimed by a hooking friend who also checked it out. She ordered it. I would love to have it too. Just starting to wool applique, looks like a nice book. Would like a copy. Love RS and all her woolies!!! Would also love to win her book!!! What a beautiful book. Would love to win it and be inspired. I love this book and I would love to win it. Thanks for the chance. This book looks like a wonderful addition to any wool lover's library. Would love to add it to mine. What a wonderful opportunity we have been given. It looks like an amazing book that any of those who enjoy wool applique would just love to have. Would love to win for a friend. Love the book. I am a newbie to Rebekah's gorgeous designs! Last year when I broke my knee in a car accident and was confined to my recliner for 2 months I decided to learn wool applique, punch needle and needle turn applique...I am completely hooked!! What a great book. Would love to win the book and begin working on the projects that are shown. Lori, I agree with everything you said about Rebekah's book. I am waiting for fabric to start my next project. So many beautiful choices in the book! Love the book..love the blog. Thank you for the give away.. I love blog hops, not only do I get a chance to win Rebecca's new book, but I get to see new blogs with wonderful art of their own. I just love Rebekah's design and color choices. I would be so appreciative of being selected to win a copy of her book. Thank you. I wish you could ALL win! Thanks for joining in and giving us a chance to win! Oh, just love wool appliqué! I can sew a mean blanket stitch! I'll go check out those other blogs too. Thanks Lori, anything that gets your stamp of approval has to be great! Drooling over this book! Sure would love to win it! I would love a chance to win this beautiful book. Thank you!! Please include me in the book offer. SO glad it directed me to your beautiful work. So glad I was following the blogs, and I found yours, just love your site. the book looks wonderful, so many gorgeous wool projects. This book looks like a keeper! Thanks for the chance to win it! This is certainly a beautiful book and I would love a chance to win. Please enter me for a chance. Looks like a great book! Love the projects! ...Thank you for the giveaway and have a lovely weekend! ...Love the bit of stitchery you're working on there too! I am a book learner. I love books, can't afford classes. I love working with wool and this book is on my list. The cover art is just so beautiful. Enjoying the blog tour. Love the patterns in the book! Wool work is as comforting as chicken noodle soup on a cold Winter day. Thanks for a chance at this wonderful book. I would love to win this wonderful book! Her work...,,, I would need easy novice! But I would love to try! Would �� to win this book as I Adore RS !!!! This book looks wonderful! The projects are gorgeous! I would like to get this book. Really good sharing! That looks like a great book. The cover pulls you right in.. Thanks for the chance to win. She is an amazing artist! Thanks for the chance to win her book. The book looks like it's full of wooly inspiration-- thanks for the chance to win! Can't wait to see this book. Her style is timeless. Would live to win a copy of this book. I love her work! Rebekah's work is amazing--thank you for the chance to win ! I just discovered RS and what a breath of beautiful wool appliqué done folk art style. Love it. Would love to win!!!!!!!! Would love to win this book! It is beautiful. Thanks for sharing your talent with us on your blog. I am looking forward to purchasing Rebekah's book in the near future, but thank you for the opportunity to win a copy. I have enjoyed following your work for years, ever since reading about you in Mary Engelbreit's magazine way back when! I would love to win this gorgeous book-thanks for the chance! 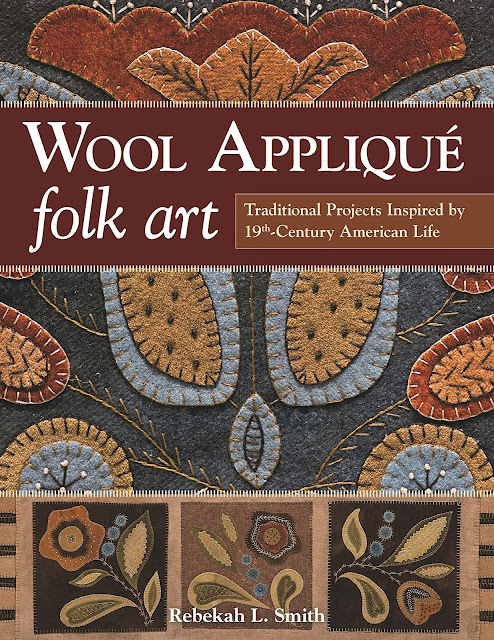 I would love this book...I love wool applique and am a beginner at rug hooking. this is a wonderful blog hop! Hello Ladies and Gentlemen . . .
We have a winner of the book . . . Congrats Trudi! & Happy stitches to all!